Monday Mango Special Bonanza! 3-6pm Today! Unbelievably off-season, some of our mango trees flowered in early winter. The Julie mango fruits are actually ripe now and we have more than we can eat, so a tub of mangoes will be available at the farmstand today! Open today and Wednesday, 3-6pm (Saturday 10am – 12noon on South Shore Road, between Ha’Penny and the Boy Scout Camp. I must be dreaming. 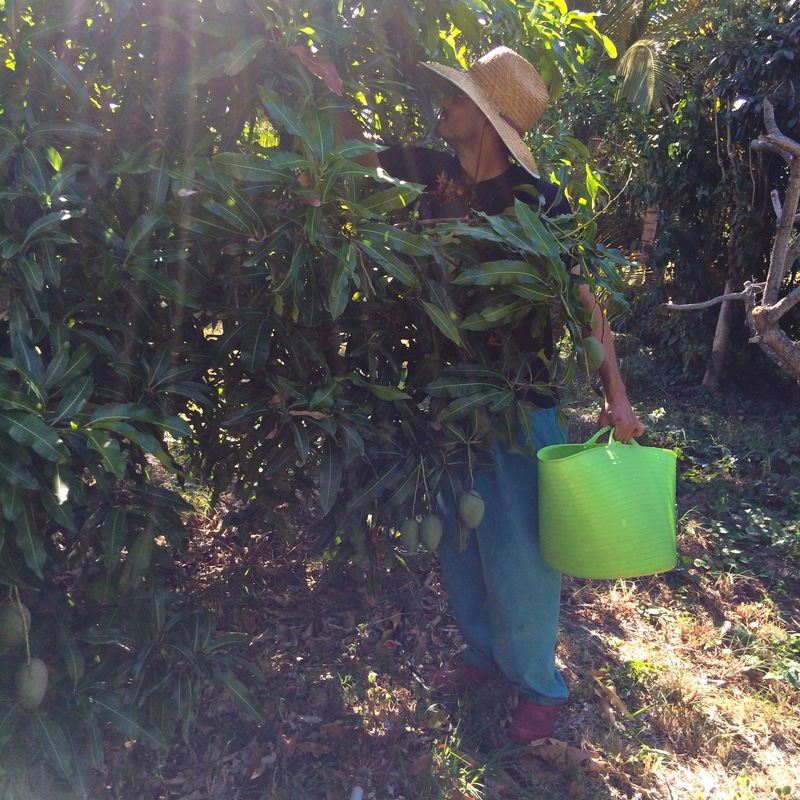 Farmer Luca is filling a bucket with RIPE MANGOES in FEBRUARY?? Off season madness! 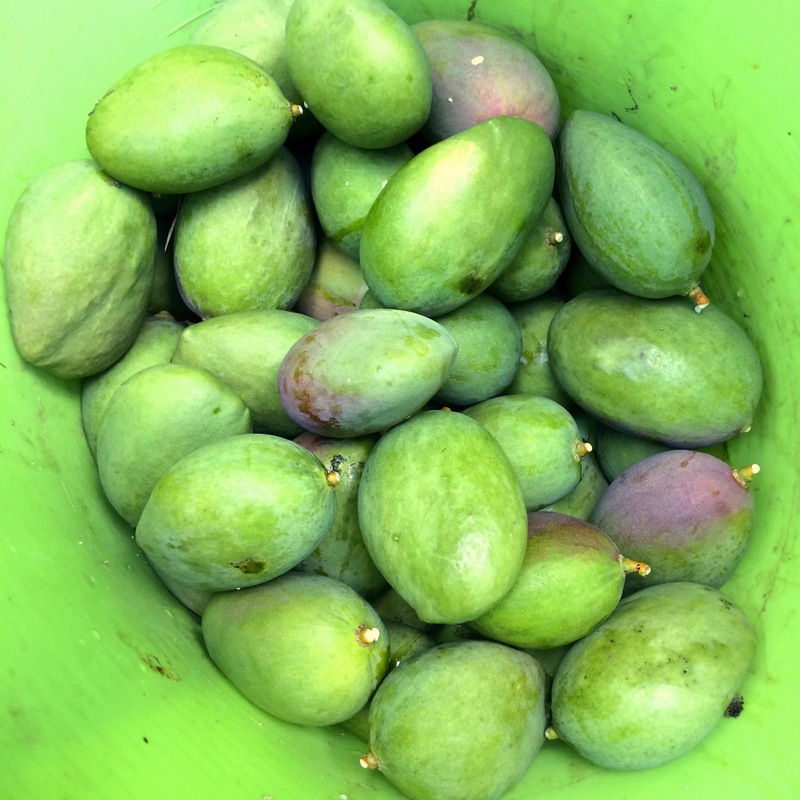 Julie mangoes grown at ARTfarm! Ripe in February – very unusual. Also available for your health and enjoyment: Sweet salad mix, microgreens, baby and regular spicy salad mix, baby and regular arugula, purple yard long beans, loads of tomatoes of all types, piles of pints of cherry tomatoes, black sapote (a.k.a. chocolate pudding fruit), passionfruit, Italian basil, holy basil, lemon basil, garlic chives, cilantro, chili peppers, fresh ginger root and fresh cheerful zinnia flowers. 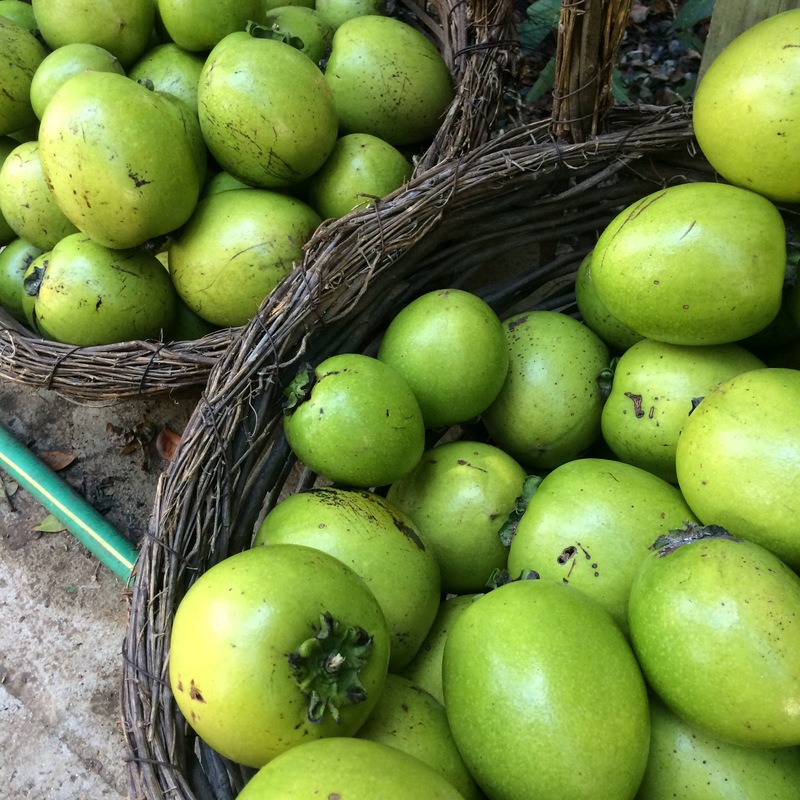 Two giant baskets hold dozens of large green-skinned black sapote fruits, also known as the “chocolate pudding fruit”. By now you’re wondering what the heck to do with chocolate pudding fruit…these will be ripe in a few days to a week, when the skin takes on an olive-yellowish cast and the fruit softens, so you have time to research more recipes for these Mexican persimmons! (If you cut into it and the flesh isn’t dark brown, it isn’t ripe yet and will have a bitter flavor). Black sapotes are great eaten out of hand, prepared either sweet OR savory, blended in a drink or smoothie…with a pinch of brown sugar the sweet dark brown flesh takes on the character of chocolate pudding! The Crucian Contessa has promised to give us some more ideas soon for this vitamin C-rich fruit! Have you tried the coconut-based homemade vegan ice cream we get from I-Sha? 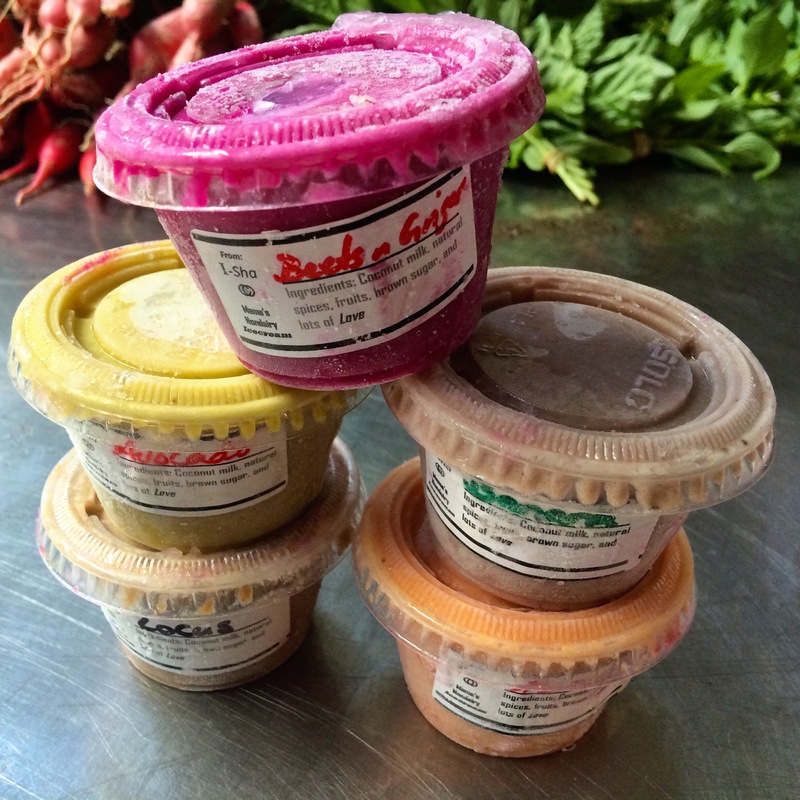 Right now we have some of their absolute best flavors: beet ginger, mamey apple, locust bean, avocado and banana! We’ve got spoons at the farmstand so you can take a few minutes and enjoy one after you shop! Delicious, non-dairy, coconut based local fruit ice creams from I-Sha are the unique-to-St.Croix creations of Feel-I and Shalima. The coconut cream used in the ice cream is made fresh from local coconuts! Nothing canned!! These little treats are the perfect size for a light and refreshing dessert or anytime snack. Pictured here, clockwise from top: Beet-Ginger, Banana, Mamey Apple, Locust Bean, and Avocado!